Medveščak Zagreb (Croatia) has left the KHL and will rejoin the Austria-based Erste Bank Liga as a full member for next season, the league announced Wednesday. Medveščak left Erste Bank Liga and spent the past four seasons in the KHL, making the playoffs once (its first year). Helsinki newspaper Ilta-Sanomat reported that the KHL helps finance new clubs for three seasons and with the absence of league aid this season, Medveščak had serious financial difficulties. With the IIHF World Women’s Championship scheduled to be held in Plymouth, Wash., from March 31 through April 7, the defending champions it could be that the defending champions won’t be there. Players on the U.S. women’s national team said Wednesday that they will boycott the tournament if USA Hockey, that country’s governing body, doesn’t provide more support. Team USA won its seventh title in nine years in Kamloops a year ago. As Christine Brennan of USA Today points out right here, this is a scrap that USA Hockey can’t win. “This simple act of defiance — so bold, so natural and so right — is an urgent call for change within the U.S. Olympic world in the 21st century, for respect for women in a sport led by men and for the acknowledgment of a job well done by a nation that craves winning more than almost anything else. Even The Wall Street Journal has taken notice of this story, with Matthew Futterman filing this piece right here. The seven Sutter brothers and their parents, Grace and Louis, will be among the 2017 inductees into the Alberta Hockey Hall of Fame. The gala induction ceremony is scheduled for July 23 in Canmore. . . . Brent, Brian, Darryl, Duane, Gary, Rich and Ron Sutter will go into the hall with six of them having totalled 4,994 regular-season NHL games. . . . The other 2017 inductees will be Mel Davidson, a former coach of the Canadian women’s national hockey team; Glen Sather, a former NHL player who made his name as the GM and head coach of the Wayne Gretzky-led Edmonton Oilers; former NHLer Bill Hay, who spent 15 years as chairman and CEO of the Hockey Hall of Fame in Toronto; Tony Kollman, who had success in Alberta at a senior hockey player; and Perry Pearn, now an assistant coach with the Vancouver Canucks. . . . The Alberta Hockey Hall of Fame is located in Red Deer. They are going to have a party before the BCHL’s Penticton Vees play their final round-robin game in the Western Canada Cup on May 4. That’s because Paul Kariya and Brendan Morrison will be added to the team’s Ring of Honour in a pregame ceremony. . . . “The creation of the Ring of Honour was a huge part of our Western Canada Cup bid,” David Michaud, the WCC’s chairman, said in a news release. “We felt it would add tremendous character to the South Okanagan Events Centre, and the additions of Brendan Morrison and Paul Kariya were obvious choices for the WCC. We thank them for coming back and celebrating this big night in person with us.” . . . Kariya played two seasons (1990-92) with the Penticton Panthers, putting up 244 points, including 92 goals, in 94 games. . . . Morrison played with the Panthers in 1992-93, recording 94 points, 35 of them goals, in 56 games. . . . Kariya and Morrison both went on to successful NCAA and professional careers. . . . The WCC runs from April 29 through May 7 in Penticton. . . . Already in the Vees’ Ring of Honour: Ivan McLelland, George McAvoy, Grant Warwick, Bruce Affleck, Grant Mulvey, Larry Lund, Bob Nicholson, Gordie McKay, Kevin Maxwell, Chris Parker, Andy Moog, Rick Kozuback and Ray Ferraro. Jon Rosen, a former radio voice of the Everett Silvertips, will do play-by-play tonight (Thursday) as the Los Angeles Kings play host to the Buffalo Sabres. the Rockets. . . . Davis scored his eighth goal of the season, on a PP, for a 1-0 lead at 5:30 of the first period. . . . Kelowna F Dillon Dube tied it with No. 20 just 11 seconds later. . . . D Aaron Irving’s 18th goal gave Everett a 2-1 lead at 9:26. . . . Everett’s other two goals came from F Dominic Zwerger, who has 28 goals. 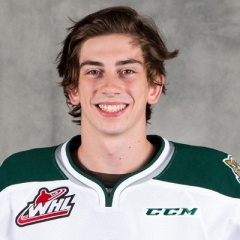 He scored at 8:38 of the second period and then added an empty-netter at 18:54 of the third. . . . G Carter Hart stopped 26 shots for Everett. . . . Kelowna G Michael Herringer blocked 25 shots. . . . Everett was 1-3 on the PP; Kelowna was 0-5. . . . Kelowna F Reid Gardiner had a 15-game point streak come to an end. . . . The Silvertips (42-16-11) are second in the U.S. Division, one point behind the Seattle Thunderbirds. . . . The Rockets (43-22-5), who had scored at least three goals in 15 straight games, had won their previous seven games. They are second in the B.C. Division, two points behind the Prince George Cougars. Each team has two games remaining. . . . Announced attendance: 5,073. Kootenay Ice, 8-1. . . . The Hurricanes took control with four first-period goals, the first one from Estephan, on a PP, at 5:45. . . . F Alec Baer (14), F Jordy Bellerive (27) and D Calen Addison (8) also scored in the opening period. . . . Estephan got his second goal at 10:22 of the second period and completed the hat trick with his 35th goal of the season at 16:06 of the third period. . . . F Egor Babenko (23) and F Ryan Vandervlis (7), shorthanded, also scored for the winners. . . . The Ice got its goal from F Colton Kroeker (18) at 5:00 of the third period. . . . Babenko, Vandervlis and F Ryan Bowen each had two assists for the winners, with Baer adding one. . . . G Stuart Skinner earned the victory with 33 saves, four fewer than Kootenay’s Jakob Walter. . . . Lethbridge was 1-5 on the PP; Kootenay was 0-4. . . . The Hurricanes (44-19-7) had lost their previous two games. They will meet the Red Deer Rebels in a first-round playoff series. Lethbridge was 5-0-1 against Red Deer this season. . . . The Ice (14-44-12) has lost eight in a row (0-6-2). . . . Announced attendance: 3,617. At Moose Jaw, the Brandon Wheat Kings erased a 1-0 deficit and went on to beat the Warriors, 3-1. . . . This game was to have been played on March 8 but was postponed by impassable road conditions. . . .
With the victory, Brandon clinched the Eastern Conference’s first wild-card spot, meaning the defending-champion Wheat Kings will draw the Central Division-champion Medicine Hat Tigers in the first round. . . . D Jett Woo had given the Warriors a 1-0 lead with his fifth goal at 8:49 of the second period. . . . The Wheat Kings tied it on F Connor Gutenberg’s 13th goal, at 12:49 of the second period, and went ahead when F Reid Duke got No. 37, at 14:17. . . . F Caiden Daley added insurance with his second goal of the season, at 13:27 of the third period. . . . G Logan Thompson stopped 28 shots for Brandon, with Brody Willms turning aside 21 at the other end. . . . Each team was 0-2 on the PP. . . . 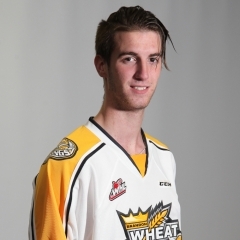 The Wheat Kings were without F Tyler Coulter, who drew a TBD suspension for a charging major and game misconduct he incurred in Tuesday’s 6-3 loss to the visiting Swift Current Broncos. He was suspended in October for two games after taking a checking-from-behind major. . . . Brandon also scratched D Kale Clague and F Tanner Kaspick, with undisclosed injuries, and D Garrett Sambrook (ill). . . . The Wheat Kings (31-29-10) had lost their previous 10 road games. . . . The Warriors (41-20-9) have lost four straight (0-3-1) for the first time this season. They are second in the East Division and will meet the third-place Swift Current Broncos in the first round. . . . Announced attendance: 3,108.
the Rebels beat the Calgary Hitmen, 5-1. . . . Hagel, an 18-year-old from Morinville, Alta., has 67 points, including 29 goals, in 63 games. He has 11 points, seven of them goals, over his past four games. . . . 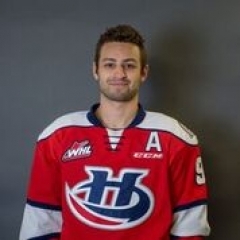 The Rebels (30-28-12) wrapped up third place in the Central Division, setting up a first-round series with the second-place Lethbridge Hurricanes. . . . Red Deer has points in seven straight games (5-0-2). . . . The Hitmen (28-32-10) had won their previous three games. They could have clinched a playoff spot, eliminating the Saskatoon Blades, with a victory. . . . Hagel scored the game’s first two goals, both via the PP, at 12:51 of the first period and 2:48 of the second. . . . F Michael Spacek upped it to 3-0 with No. 30, at 11:48. . . . The Hitmen got a shorthanded goal from F Beck Malenstyn, who has 29 goals, at 14:25. . . . F Jordan Roy (5) and F Dawson Martin (10) added third-period goals for Red Deer. . . . D Colton Bobyk and Spacek each had two assists, with Martin adding one. . . . 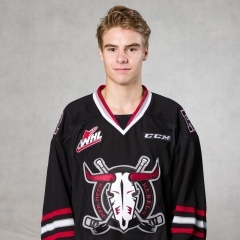 The Rebels got 26 stops from G Riley Lamb. . . . G Cody Porter turned aside 24 shots for Calgary. . . . Red Deer was 2-4 on the PP; Calgary was 0-4. . . . The Rebels (30-28-12) have points in seven straight (5-0-2). . . . The Hitmen (28-32-10) had won their previous three games. . . . Announced attendance: 4,221.
of the second period, tying John Miner (1984-85) for that mark. . . . The Pats also set a franchise record for victories in a season (50). They had shared that record with the 1980-81 team. . . . The Pats took a 3-0 lead into the second period on goals from F Adam Brooks (40), F Dawson Leedahl (34) and D Sergey Zborovskiy (7). . . . The Broncos cut into the home team’s lead when F Lane Pederson got his 25th, at 3:15 of the second period. . . . But the Pats responded with the next three goals, from F Nick Henry (35), on a PP, Hobbs, and F Filip Ahl (26). . . . F Ryley Lindgren (26) got the Broncos’ last goal on a third-period PP. . . . 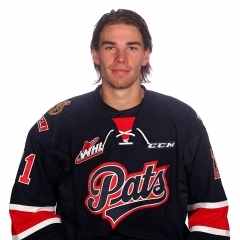 The Pats got three assists from F Sam Steel, who leads the WHL with 130 points, seven more than Brooks, the defending scoring champion. . . . Brooks also had two assists, for a three-point night, as did Leedahl. Henry added one assist. . . . F Glenn Gawdin had two assists for the Broncos. . . . G Jordan Hollett stopped 24 shots for Regina. . . . The Broncos got 35 stops from G Taz Burman. . . . Regina was 2-4 on the PP; Swift Current was 1-6. . . . F Kaden Elder was among the Broncos’ scratches, after being injured in Tuesday’s 6-3 victory over the Wheat Kings in Brandon. He was injured on a play in which Brandon F Tyler Coulter drew a charging major and game misconduct. . . . The Broncos also scratched G Jordan Papirny (ill) for a fourth straight game. . . . Regina (50-12-8) has won six in a row and will meet either the Calgary Hitmen or Saskatoon Blades in the first round. . . . Swift Current (38-22-10) had won its previous three games. The Broncos will finish third in the East Division and meet the Moose Jaw Warriors to start the playoffs. . . . Announced attendance: 5,366.
of the first period. . . . Seattle responded with the next three goals. . . . F Ryan Gropp tied it, on a PP, at 17:27. . . . The Thunderbirds took the lead at 2:08 of the third period when F Zack Andrusiak scored his sixth goal. . . . Gropp, who has 34 goals, upped it to 3-1 at 3:15. . . . Gropp equalled his career-high for goals in a season that he set last season. In the past three seasons, he has scored 30, 34 and 34 goals. . . . F Jaret Anderson-Dolan’s 37th goal got the Chiefs to within one at 5:29. . . . Seattle D Austin Strand iced it with his ninth goal, at 9:02. . . . F Keegan Kolesar had two assists for Seattle. He has 32 assists in 52 games, beating his single-season high of 31 that he had in 64 games last season. . . . 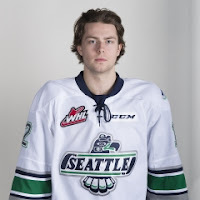 In the absence of F Mathew Barzal, who is being tested for the mumps virus, F Alexander True played in the middle between F Keegan Kolesar and F Ryan Gropp on Seattle’s big line. . . . Asked if he had seen test results on Barzal, Seattle GM Russ Farwell, who was in Spokane with his team, responded: “Not as of yet.” . . . G Carl Stankowski stopped 15 shots for Seattle. . . . At the other end, Donovan Buskey blocked 32 shots in his first career WHL start. . . . Seattle was 1-2 on the PP; Spokane was 0-2. . . . Aside from Barzal, the Thunderbirds also scratched G Rylan Toth, D Jarret Tyszka, D Reede Harsch and F Scott Eansor. . . . The Thunderbirds (45-19-6) have won four in a row. They have a one-point lead over the Everett Silvertips. . . . The Chiefs (26-33-10) have dropped seven straight (0-6-1). . . . Announced attendance: 4,102. Vancouver at Kelowna, 7:35 p.m.
Vancouver vs. Seattle, at Kent, Wash., 5:05 p.m.
Everett vs. Tri-City, at Kennewick, Wash., 5:05 p.m.